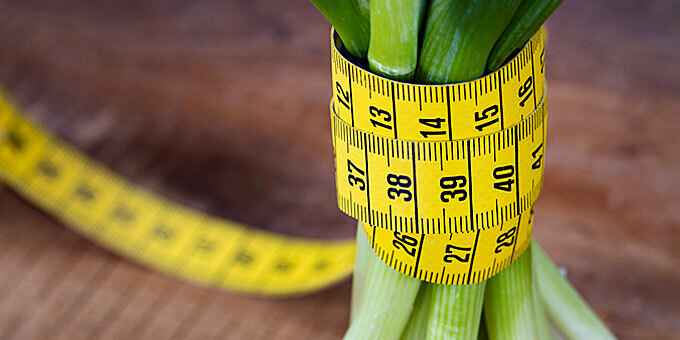 Keeping you portion sizes under control is a great way to lose weight or just to maintain a healthy weight and is an easier way to cut calories than eliminating food, skipping meals or embarking on complex diet plans. Over the years, portion sizes in restaurants and fast food outlets have increased significantly, probably playing a part in the ever rising rates of obesity and lifestyle diseases. Here are 10 portion control tips to make sure your portions stay reasonable and to eliminate excess calories from your diet. You may feel silly getting out the scales or measuring cups to portion out your food, but doing this gives you the best idea of exactly how much food you are eating. If you do not realize how much you are eating you can have no idea how many calories you are consuming, which makes it difficult to cut back or to find the reasons for unwanted weight gain. If you learn to identify what half a cup of cooked pasta or rice looks like, you can more easily estimate how much you are actually eating, which in turn makes it much simpler to reduce quantities. Use the food packet serve size as a rough guide and try to aim for only one serve. For example, many breakfast cereals quote a serve size as 45g of the product, which for most people is a lot less than they actually consume. By weighing out this serve size before eating, you will know exactly how many calories you are consuming and will probably be cutting back on quantity and therefore saving some calories. Studies have shown that people who eat off smaller plates tend to consume less than those using bigger dishes. This is probably because the food appears to take up more space on the plate and it looks like you are eating more. If you have a larger plate, you are more likely to fill it completely and end up eating more, so invest in some smaller dishes, even child sized to cut your calorie intake. Whilst it takes some getting used to, eating with smaller cutlery is similar to eating off small plates in terms of reducing the quantity you are consuming. Smaller spoons mean that it takes longer to eat the food, usually meaning you will eat less. Rather than weighing out all the food you eat, which can be impractical and time consuming, try using visual references to give a gauge of portion sizes. This is also good when someone else prepares the food for you as it means you can choose how much of the portion to eat. For example, a reasonable portion size for a piece of meat is the size and thickness of a pack of playing cards, a cup of rice should be about the size of a baseball, a piece of fish should be around the size of a check book and a sensible cheese serving should be the size of three playing dice. You can make your own visual references by measuring out food the first time and then finding an object that represents the size of the serve accurately that you can picture in the future. By upping the quantity of healthy and low calorie foods on your plate you can reduce the quantities of less healthy foods and still have a full plate. The MyPlate system, created by the U.S. government gives a good idea of the ratio each component of the meal should take up on the plate, with the largest section of the plate dedicated to vegetables. Restaurant meals are notoriously large and often higher in calories compared with home cooking anyway, so portion control is particularly important when eating out. Share meals with a friend, order a starter instead of an entrée and avoid extras such as the bread basket to keep calories down. Sitting in front of the TV with a whole bag of potato chips or block of chocolate is the quickest way to eat more than you should. Mindless eating often leads to overeating and much large portions of foods being consumed. To avoid this calorie trap, try portioning out the amount of the food that you wish to eat into a smaller container or bag and take that with you, resealing the larger packet and leaving it somewhere you cannot see it. If you buy large packets of food in bulk for cost saving reasons, portioning the food out into individual bags or containers for school lunch boxes or portable snacks is also a great way to keep serve sizes reasonable. Leaving a bowl of food on the table in front of you is usually far too easy to dip into and eat second and even third serves. Put your serve of food in a dish and take that to the table rather than the whole serving dish. If you are still hungry you can always return to the kitchen for more, but you are far less likely to eat it without thinking. Although food waste is a big problem, eating leftovers from other peoples plates or that are left after a meal can really bump up your calorie intake. Although you may be eating a normal portion originally, the left overs can often equate to the same amount of food again and you may not even realise you are eating it. If you find you have excess food, try to package it up as soon as possible and store in the freezer or refrigerator for a later date to avoid mindless bowl scraping and picking. Missing meals or not eating at regular time intervals can leave you feeling ravenous and much more likely to eat huge portions at your next meal. Make sure you eat something at least every three to four hours to avoid overeating later on.